In early September we lost William “Zeke” Grader, Jr., a tireless and impactful advocate of free flowing rivers, wild salmon, and family fishermen. With a passion for a healthy environment, especially for the fish, Zeke was an energetic, articulate, and expert spokesman on the subjects he cared about. In the months before his passing, Zeke was the subject of various accolades, newspaper articles, congressional recognition, etc. While his many roles and accomplishments have been described with respect and affection by others, and I’ll touch on them below, what maybe overlooked is that Zeke was one of San Francisco’s entrepreneurs in that he took the lead from an early stage on many environmental initiatives. Raised on the north coast of California, Zeke had commercial fishing in his life from youth. 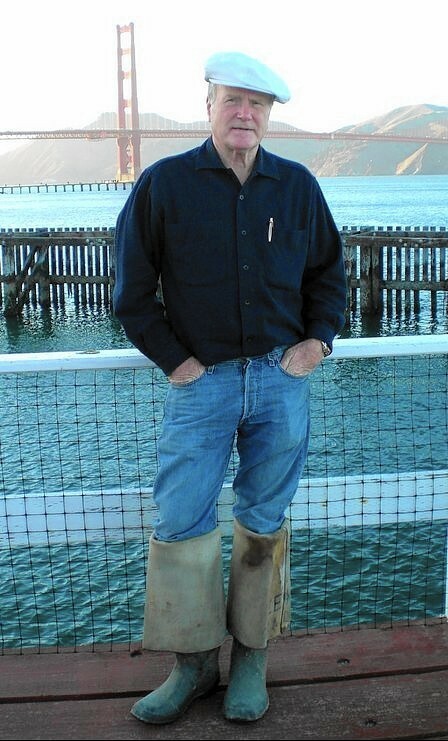 After serving in the U.S. Marine Corps, he attended law school at University of San Francisco; then, upon passing the bar and in lieu of pursuing a traditional career in the law, Zeke chose to take the role of Executive Director of the newly formed, fledgling Pacific Coast Federation of Fishermen’s Associations (PCFFA), a federation of 25 port and fishermen’s marketing associations from San Diego to Alaska, the largest trade association of commercial fishermen on the west coast. Zeke led that non-profit from his hiring in the mid 1970’s until earlier this year and through it took on many fish habitat and other environmental issues. In addition to leading PCFFA, in 1992 he founded the non-profit The Institute for Fisheries Resources, whose mission is “to protect the natural resource bounty of the Pacific Ocean along the western seaboard of North America, including Alaska and Hawaii.” Zeke served as Executive Director of IFR until earlier this year. I met Zeke around 2003 as I began to pursue the idea of a film festival based on films related to the ocean. When I dropped in as an unannounced visitor to his waterfront office (whose busy appearance reminded me of mine! ), Zeke was friendly and encouraging. Over the next several years, as the festival launched and gained momentum, Zeke was there – He willingly took on the role of behind the scenes point person for fresh fish, ensuring and subsidizing (with his fishing colleagues) a supply of super fresh seafood for several of the festival’s opening receptions, which were important fundraisers and festival community building events. I’ll always remember Zeke’s steady outlook and admire his commitment and willingness to work on issues he believed in with or without public recognition. He was a person I am glad to have known and wish I’d have known better. Zeke just a few steps from his office. Published on March 17, 2013, this clip is part of a series of video presentations from the State of the California Central Coast symposium, held February 27 – March 1, 2013 in Monterey, CA. The symposium focused on the monitoring and management of California’s Central Coast regional network of marine protected areas (MPAs). The presentations and panel discussions shared ecological and socioeconomic results from the first five years of MPA monitoring in the region and new approaches for MPA implementation. The results are accessible in an ‘e-book’ format that includes inteactive graphs, videos and more on http://www.oceanspaces.org. The symposium was convened by California Ocean Science Trust and MPA Monitoring Enterprise, California Department of Fish and Wildlife, California Fish and Game Commission, and the California Ocean Protection Council. This entry was posted in People of note, Saltwater. Bookmark the permalink. Thx, Krist, for this piece. I really enjoyed it. Sometime let’s talk about my relatives in the Pacific Northwest that are in the fishing & seafood industries. Maybe on a hike?